The mobile App ecosystem is now one of the largest industries in the world. In 2017, there were over 2 million iOS Apps on the App store, and over 3 million Android Apps on Google Play. This makes it a very competitive marketplace. So if you have put in a lot of effort to build a great App, going through the steps we outlined in Building a Mobile App: Here’s Your Blueprint to Success then you now need to plan your mobile app marketing strategy to gain adoption. While there are many aspects to marketing your App, one of the concepts that would be useful for you to focus on is App store ranking. Just as good ranking of a website on a search engine, for example, page 1 of Google, helps to attract visitors and get business leads, similarly, an App’s ranking on the App store has a huge impact on number of downloads. Apple states that 65% of the downloads on the App store result from a search. App Store Optimization is a systematic approach to improve your App store ranking and key to marketing an App successfully. This is essential so that your App will show up when potential users are searching. You need to have consistency of the keywords across the title, App description and user reviews. Once users have found your App through an organic search, the creatives on your App store page will play a key role in influencing their decision to download the App. You can test different versions of your App store page – using different layouts, icons, graphics or videos, and testing the response to these combinations. Ratings and reviews about your App submitted by users also have an impact on your App store ranking. In addition to App Store Optimization, there are other ways in which you can build awareness and direct relevant traffic to your App store page, thus increasing the chances of downloads. Create a good webpage, describing the App, and link it to your App store page. You can also place links to the App on other relevant positions in your site. Create and maintain a buzz about your App by relevant social media posts. Use social media channels, such as Facebook, LinkedIn, Twitter, Instagram etc, to engage with potential and existing users. You can use Google ads or ads on other platforms such as Facebook for mobile App promotion and drive targeted traffic to your App. Once users download and start using your App, it’s essential that they have a great experience. You will need to focus on ensuring this, so as to get good reviews and ratings, as well as word-of-mouth publicity and social media shares. It is also very important to plan for continued engagement with your users so that they don’t forget about your App or uninstall it. For this, you need to study the way they are using the App and focus on delivering increasing value to them. Notifications and special offers from time-to-time can help to build this engagement. 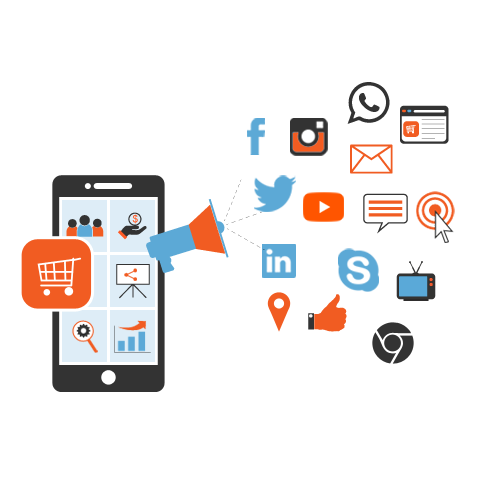 Engaged and delighted users will drive adoption further and are a valuable aspect of mobile App marketing.